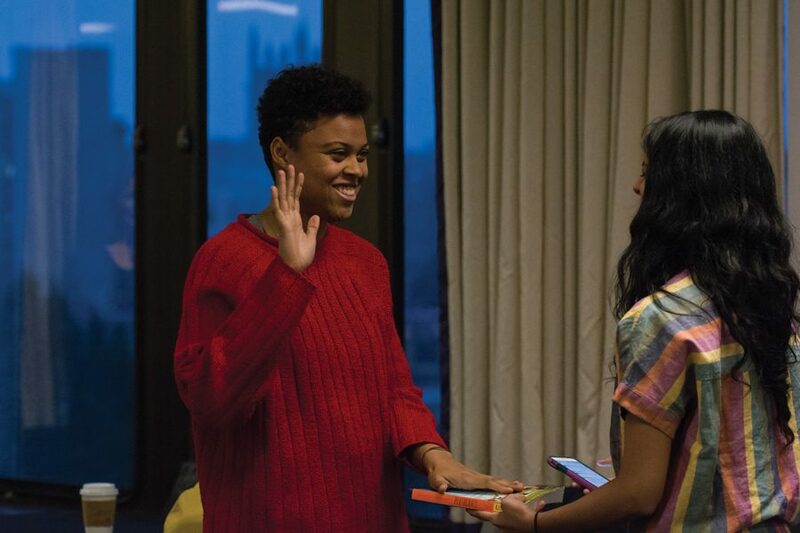 Sky Patterson was sworn in as the Associated Student Government president in April. She resigned earlier this month. Weinberg juniors Sky Patterson and Emily Ash were sworn in as Associated Student Government president and executive vice president at Senate on Wednesday. Patterson and Ash defeated SESP junior Justine Kim and SESP sophomore Austin Gardner in last week’s ASG election. Patterson and Ash won 49.2 percent of the vote, compared to Kim and Gardner’s 42.25 percent. Ash told The Daily the pair has been taking the past week to recuperate from the election and to work through the transition process. She also said she is looking forward to executive board selection. Outgoing ASG president Nehaarika Mulukutla reflected on her term in a speech to senators. Mulukutla recognized individual members of the executive board and senators for their roles in her administration and mentioned accomplishments such as implementing funding reform and mandatory training from the Center for Awareness, Response and Education for ASG-funded student groups. Mulukutla also advised senators to prioritize doing meaningful work over worrying about getting credit. “As long as you’re being kind and you’re trying to make a change, the most important thing is to be selfless,” she said. However, Mulukutla also said that being president was an exhausting and often draining experience that negatively impacted her mental health. Patterson told The Daily she plans to discuss this issue with the new vice president for health and wellness. ASG elected Weinberg junior Julia Shenkman and Weinberg freshman Katherine Conte to the selection committee, which will help choose the next executive board. Weinberg freshman Nyle Arora also ran but was not elected. Senate also approved a proposal from the Wild Ideas committee to fund “Stronger Together: A Night of Female Art and Friendship.” The event, an exhibition of feminist art, will take place on April 26. Later, Weinberg freshman Juan Zuniga, the interim District 6 senator, presented a resolution concerning feminine hygiene products. The resolution calls on the administration to provide feminine hygiene products on campus.